The medina of Marrakech is certainly a sight to behold but not all of us can travel at a whim to Morocco. Or can we? 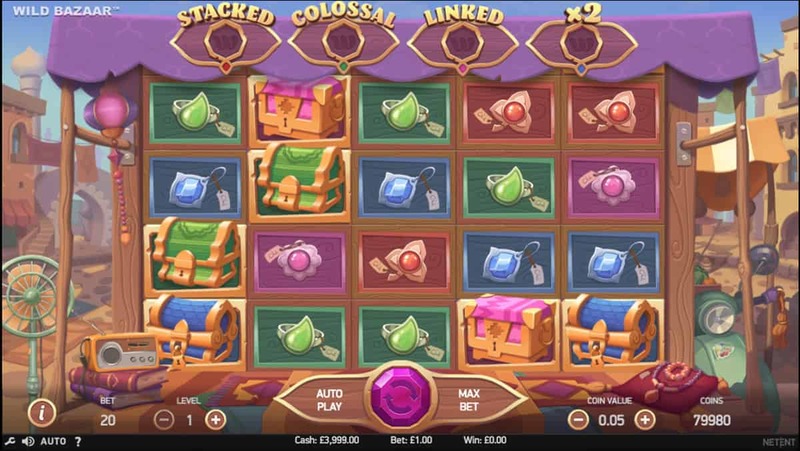 When we’re playing NetEnt’s Wild Bazaar Slot, we can enjoy market stalls and Arabian adventures from the comfort of our own home. And with Wild Spins on special offer, it’s sure to prove a lucrative trip. If Wild Bazaar seems familiar it’s because it is heavily reminiscent of Aladdin. There, we said it. Remember the classic scene when Aladdin and Jasmine are walking through the marketplace and she grabs an apple to give to a hungry kid? Yep, that marketplace. NetEnt achieve such an immersive feel that it’s almost as if we’re standing at one of the stalls. Though instead of apples, we see trinkets galore. Different coloured gems act as the main symbols while four coloured treasure chests promise even greater rewards, each of them gifting us with its own Wild bonus. 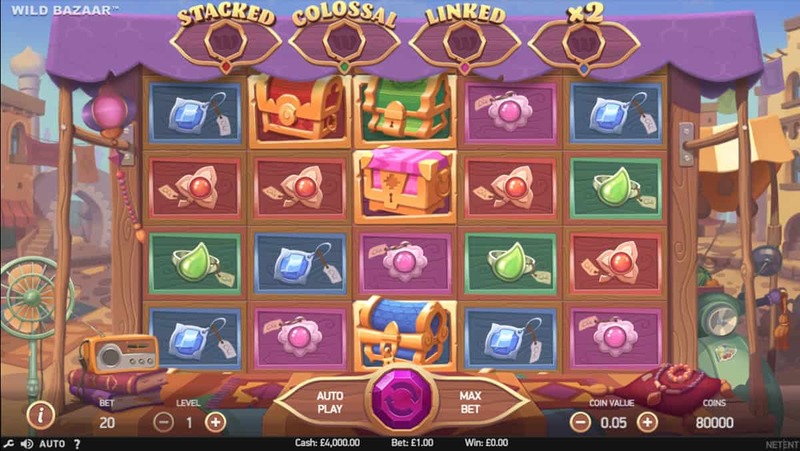 Before we begin playing this slot, we’re shown the treasure chests and their corresponding bonuses when we land three or more, set alight with vivid magical sparks as though from a genie’s touch. The top of the screen also shows which of these bonuses will be active when its empty socket is filled. Before we get to that, we enjoy jewels galore, authentic music and cartoonish graphics. 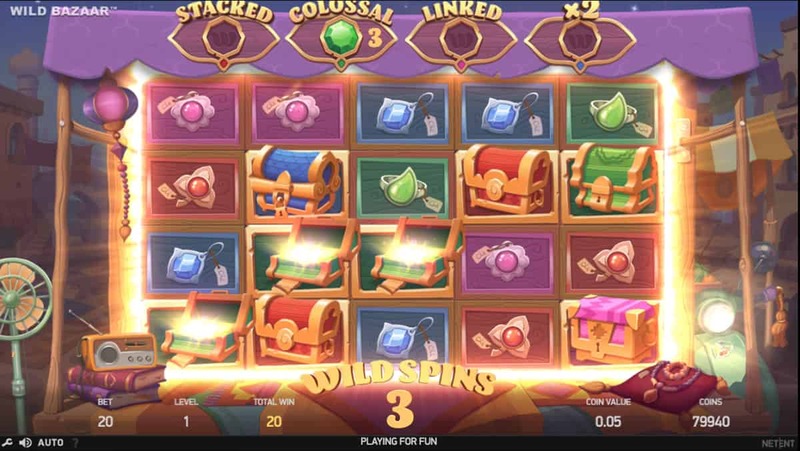 Wild Bazaar is all about the treasure chests as they trigger the slot’s various Wild Spins features. When we get three or more of the Red, Green, Pink or Blue chests, we trigger Stacked Wild, Colossal Wilds, Linked Wilds and X2 Multiplier Wilds, respectively. 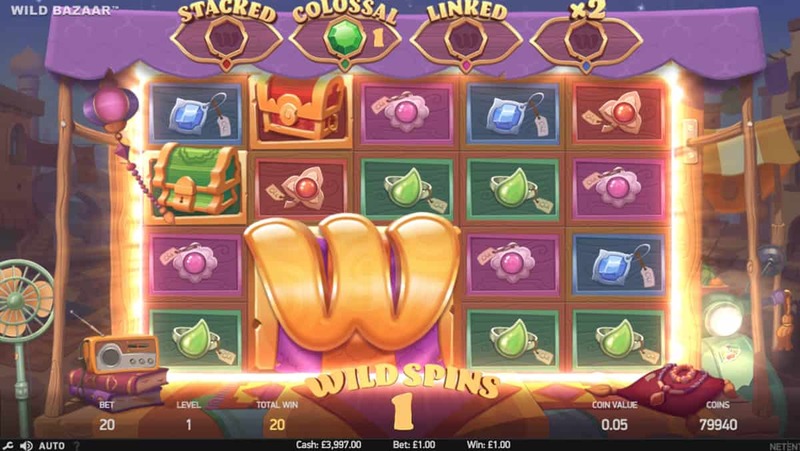 There are no traditional free spins, but instead they come as part of the Wild features. 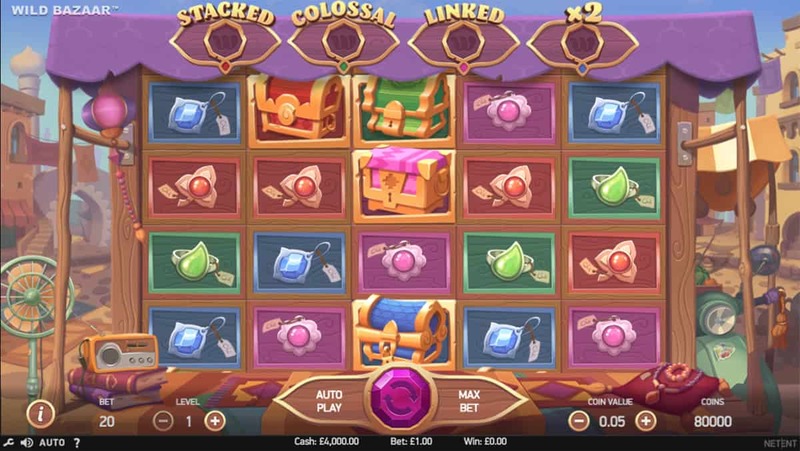 But what else would we expect from an online slot called Wild Bazaar? However, unlike a market stall in Morocco, the treasures here are certifiably valuable. And they launch quite often, meaning there are plenty of opportunities to win. It can all be easily controlled using the game buttons at the bottom of the screen. We can simply switch from auto play to manual, change our level or coin value and control how much we spend. Thankfully we don’t have to convert anything into dirham. Wild Bazaar definitely stands out due to its cartoonish design, obviously helped along the way because it evokes memories of Disney’s Aladdin. But throw in the subtle touches such as the fan spinning, radio blaring and merchant’s moping in the corner, it at once makes us feel welcome and exotic. But while we’re here we don’t want to hear about any ordinary lamp, just give us the Wild Spins and the treasure they behold.